The Port of Kiel is completely restructuring the access area to the Ostuferhafen and has begun the partial demolition of a former grain storage facility. The demolition along with the integration of adjacent areas will free up 2.8 hectares in the port access area on which expanded hard standing space can be created for trucks, trailers and cars. So far separated pre stowage sectors can now be combined outside the ISPS-zone. Dr Dirk Claus, Managing Director of the PORT OF KIEL (SEEHAFEN KIEL GmbH & Co. KG) said: “Cargo handling in the Ostuferhafen has increased in the last few years. The new access area will mean we can optimise logistics, accommodate the needs of forwarders for more space and handle more cruise shipping passengers.” A sum of €7.25 million overall is being invested in the project and funding from the federal state of Schleswig-Holstein has been applied for. The restructuring of the port access area involves the demolition of some 13,000 m² of warehousing as well as structural engineering, road works, drainage, lighting and the securing of the site. Access to the Ostuferhafen is guaranteed to remain unimpeded throughout the whole of the reconstruction period, which will last until the spring of next year. 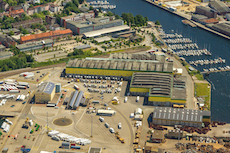 The PORT OF KIEL acquired the storage facilities and site of the former Getreide AG in 2016. The Warehouses 31 to 33 will continue to be used to store forestry products while Warehouses 34 to 36 are being taken down as part of the restructuring of the port access area. The Bodo Freimuth enterprise group has been commissioned to carry out the demolition work. It has already set up site facilities and is using heavy equipment to demolish the reinforced concrete structures. The three warehouses being demolished, along with their foundations will be cleared by the end of November. Demolition materials such as reinforced concrete structures, metals and insulation materials will be separated, sorted and either recycled or responsibly disposed of. Concrete is being broken up in an on-site crushing plant and then re-used. To minimise noise and dust emissions, the demolition site is being sprinked with water and works takes place only during the day time. Parallel to the demolition, the area is being probed for unexploded wartime ordnance. In a further step, tenders for the carrying out of structural engineering and road works are being invited from October. The Ostuferhafen is the Kiel Fiord’s main cargo and logistics hub. From here, ferry ships belonging to the shipping company DFDS operate into the Baltic and to and from Russia. Forestry products of the Swedish concerns SCA and Iggesund are stored and distributed here and bulk cargo such as scrap metal and coal as well as heavy and project loads are also handled. The Ostuferhafen can be reached via the city ring road system (the B 502 and B 76) and is connected to the A215 motorway (leading to the A7) and to the A21 motorway (leading to the A1). For the port’s growing hinterland rail traffic there are also rail links to the national intermodal transport network and to international destinations.